This is a guest post by Justin Gilmore. If you want to guest post on this blog, check out the guidelines here. Of course, paint is the first option when it comes to covering the walls in your kitchen. But finding an accent color to match the look and feel of your kitchen can be tricky. Try this approach: on the Sherwin-Williams website there is a color visualizing tool that is very handy for finding complimentary tones to match your kitchen. If that doesn’t work most professional paint stores have large books full of color combinations that can stimulate your creativity. Paint is cheap, easy to do on your own and can easily be redone. It’s a great option for the kitchen with a lot of visual activity going on in the cabinetry and countertops. Having a solid tone that “pulls it all together” is important sometimes. Yes, there are a lot of colors to paint your kitchen, sometimes a dizzying selection. But if your desires lean towards something beyond plain paint consider faux painting. Even at first blush there are a ton of options when it comes to faux painting. Glazes, textures, and colors all combine to create faux marble, leather texture, or an old mission look on your kitchen walls. Although you can find abundant information online about faux painting on your own, we suggest hiring a professional. Most kitchens do not have a large amount of open wall space and the advantages that a professional brings to the table are worth the price. Wallpaper is making a strong comeback. Once spurned as corny and cheesy, the new varieties of wall paper are very sophisticated. Just doing a simple search on Google reveals wallpaper of every kind. You can even search online for a color, design or even a particular scene. And unlike your mothers wallpaper, new wallpapers are easy to install and are very durable, which is important in the kitchen. Custom wallpaper is a new way to give your walls and spaces that personal touch that you cannot get from buying off the shelf wallpaper designs. By creating custom designs, you have the freedom to use any idea you have to make your space your own. The kitchen is a place that people often overlook when decorating their walls. 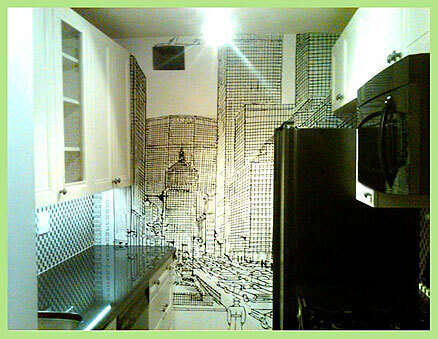 Custom wallpaper can really tie a kitchen together and make it pop! Kitchens are great for custom wallpaper designs because they usually do not have large empty walls. This makes them great for smaller, accent type of designs. The area above the counters and below the cabinetry is ideal for adding custom designs. Long horizontal designs work best in this space. Some theme ideas to consider are: flowers, shells, farm, mountain, animals, ancient sea maps, old newspaper clippings, or clouds. Any of these themes can be taken advantage of to make a kitchen design complete. Abstract designs are a great way to go as well. Geometric shapes, tribal designs, Celtic knots, mosaics, and other designs can make a fun and interesting pattern with which to decorate your kitchen. Once you have decided on a theme all you need to do is find a photo or digital image of what you are looking for. You can either take the photos yourself or buy them from an online supplier. Once you select the photo you want to use you go to megaprint.com and upload the image. They’ll print the image to your exact specifications onto wallpaper. Justin Gilmore is a freelance writer located in Boise, Idaho. He writes on topics of large format printing and custom wallpaper for http://www.megaprint.com.